The U.S. Missile Defense Agency successfully conducted a SM-3 Block IIA intercept test after two previous failed tests. The U.S. Missile Defense Agency (MDA) and U.S. Navy successfully conducted an intercept of a medium-range ballistic missile target with a Standard Missile-3 (SM-3) Block IIA missile on October 26, according to a MDA statement. 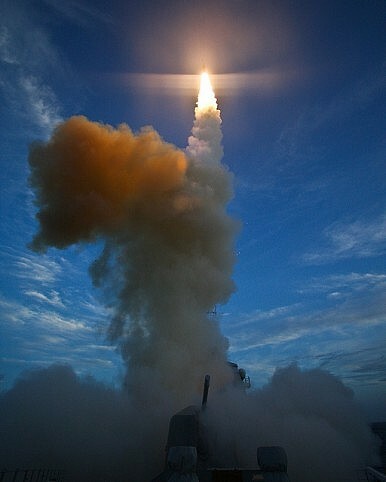 The test involved the shooting down of a mock ballistic missile target outside the earth’s atmosphere, fired from the Pacific Missile Range Facility, at Barking Sands, Kauai, Hawaii, with a SM-3 Block IIA missile launched from the Arleigh Burke-class guided missile destroyer USS John Finn (DDG-113). The SM-3 Block IIA missile is the most advanced variant of the SM-3 “hit-to-kill” interceptor series and operates as part of the Aegis ballistic missile defense system. The SM-3 Block IIA has been under joint development by U.S. defense contractor Raytheon and Japan’s Mitsubishi Heavy Industries (MHI) since 2006. Whereas Raytheon is responsible for the SM-3 Block IIA’s hardware, system development, and all-up-round integration, MHI oversees the development of the interceptor missile’s second- and third-stage rocket motors, steering control, and the missile nosecone. The United States and Japan last successfully tested the Aegis Baseline 9/5.1 BMD combat system with a SM-3 Block IIA missile in February 2017. Two other tests of the missile in June 2017 and January 2018 failed. The SM-3 Block IIA is designed to destroy short- to intermediate-range ballistic missiles. Possessing a much greater horizontal and vertical range than its predecessors, the SM-3 Block IA and SM-3 Block IB, the SM-3 IIA missile is thought to have a maximum operational range of 2,500 km (1,350 miles). It also carries a much more advanced kill vehicle than previous SM interceptor variants. The missile can be deployed on Aegis-equipped guided missile destroyers or on land, via Aegis Ashore sites. In January, the U.S. State Department approved a potential sale of SM-3 Block IIA missiles to Japan for an estimated cost of $133.3 million. The first SM-3 Block IIA missiles are slated for operational deployment by the end of 2018. Last month, the Japan Maritime Self-Defense Force (JMSDF) and MDA, in cooperation with the U.S. Navy, also conducted a successful test of the Aegis Baseline 9/BMD 5.0 combat system that involved the test firing of a SM-3 Block IB interceptor missile launched from a Japanese guided-missile destroyer. An Aegis Ashore-launched SM-3 Block IIA interceptor failed to hit its target during a ballistic missile defense test on January 31st.